2 Hubs, 8 Rear Studs, Timken Wheel Bearings. Seals, O'Rings & Carriers, Split Locking Rings (LH & RH). Manufactured in UK by Rix Engineering. 2 x Fully Floating Alloy Hubs. 8 x Group 4 1/2" UNF Rear Studs. 4 x High Quality Timken Wheel Bearings. 2 sets Seals, O'Rings & Carriers. 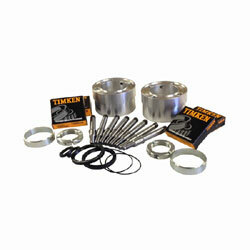 2 x Split Locking Rings (Left Hand & Right Hand Threads).